This recipe exceeded my expectations. I love all the ingredients so I knew it would be good but I was anticipating it to be difficult and messy to eat. Not only was it incredibly delicious, but it wasn't too messy to eat. I used a Fuji apple, they are my favorites. Not too crispy and not too sour, but still with lots of flavor. The filling was fantastic, I LOVED the sunflower seeds in it! This is Day 20 of 30 Days of Vegan recipes. I got this recipe from, Vegalicious, the blog that inspired my 30 vegan days. I know I skipped 2 days but I had trouble getting pictures off my camera. Plus, I've been making so many meals that I've been eating leftovers a lot. I LOVE having leftovers in the refrigerator. My family still isn't on board with my eating so I'll prepare a meal for them, and then will just grab something quick from the refrigerator for myself. 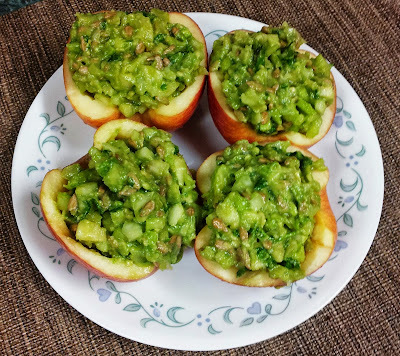 Cut apples in half, take out stems and core. Using a melon baller, or a knife, scoop out the insides of the apple but don't cut through the skin. To make sure your boats don't rock, cut off a tiny sliver of flesh on the bottom. 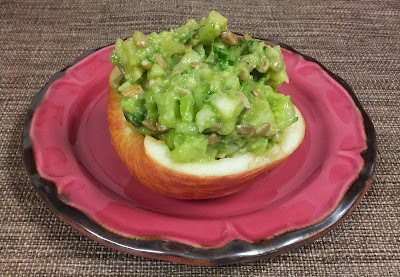 Pour lemon juice into a bowl and quickly dip the edges of the apple into it so they don't turn brown. Take the apple insides and chop into small pieces. Add celery and pour remaining lemon juice into the apple mixture. 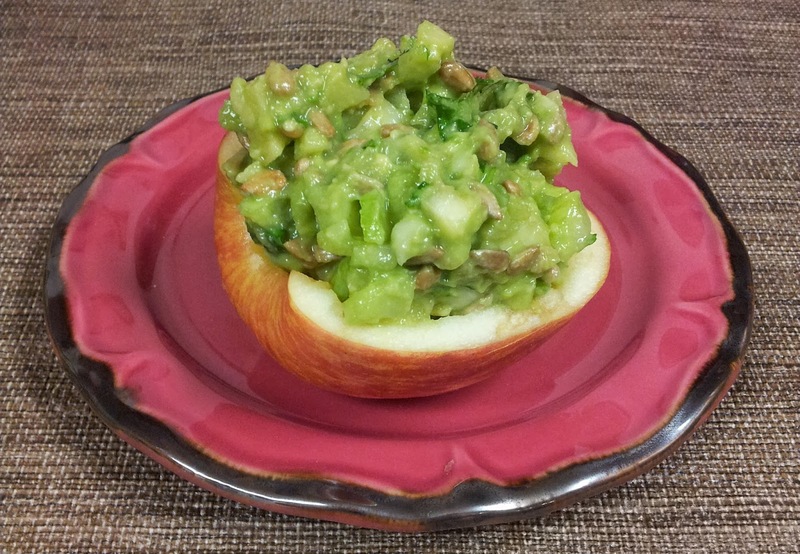 Cut avocado in half and mash until creamy. Add to apple mixture and mix thoroughly. 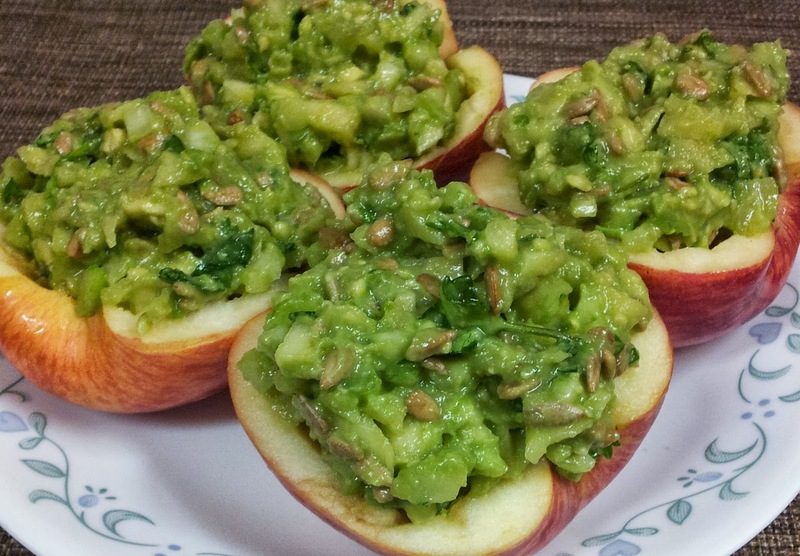 Fill apple boats with the mixture and serve immediately or store covered in the refrigerator.